The Drexel University men’s and women’s crew teams got off to strong starts in competitions both at home and on the Cooper River (Photograph courtesy of Drexel Athletics). The Drexel University men’s and women’s crew teams have started their season with some top three finishes and dual race wins. They began their respective seasons with races against La Salle University and Villanova University March 16 on the Schuylkill River. The women’s team swept both of their races against La Salle while the men won the varsity eight and third varsity eight categories but fell to La Salle in the second varsity eight. In the varsity eight categories, the men’s first varsity eight and second varsity eight raced placed one-two with times of 5:48.9 and 5:49.8, respectively. It was a battle to the finish line as less than a second separated the two crews while La Salle finished 10 seconds back from first place, and Villanova was 4.4 seconds back from La Salle. In the women’s varsity eight, the first and second varsity eights also went one-two with times of 6:32.8 and 6:41.8, respectively. La Salle was 13.4 seconds back in third place. In the women’s second varsity eight event, Drexel’s third varsity eight competed in a dual with La Salle and won by a huge margin of open water of over 30 seconds. For the next race, the teams traveled to Cooper River in Cherry Hill, New Jersey for the Murphy Cup Regatta March 23. Due to windy conditions, the men’s and women’s varsity fours, women’s novice four and men’s novice eight events were cancelled. The first events of the day were the varsity eight events. The women were in the third heat against the University of North Carolina at Chapel Hill, Colgate University and Duquesne University. The women placed in second behind North Carolina by 3.73 seconds, which earned them a spot in the grand finals. The men were in the first heat and finished in first place ahead of Rutgers University by 11.14 seconds. This also earned them a spot in the grand finals. In the women’s junior varsity eight, the Dragons were in the third heat and came in second to the University of Pennsylvania by 10.44 seconds. They moved on to the grand finals in this event as well. In the men’s junior varsity eight, the Dragons were in the third heat against Temple University, Notre Dame University and Bucknell University. They finished in third place, which placed them in the petite final for the afternoon. In the men’s third varsity eight, the Dragons placed first in the first heat, which moved them securely into the grand final. Early in the afternoon, the women’s varsity eight finals were held. The Dragons placed third overall in the women’s varsity eight event with a time of 6:48.24. Penn won with a time of 6:42.79, and North Carolina was second with a time of 6:44.82. The men’s varsity eight crew won first place in the event, coming through the line with a full boat length ahead of second place Marist College. In the junior varsity eight events, the women’s crew placed second behind Penn by only 1.92 seconds. It was a clear battle between Drexel and Penn right from the start as Drexel finished with open water ahead of North Carolina, who took third place. The men’s team placed second in the petite final and eighth overall in the junior varsity event. The men won the third varsity eight event more than 13 seconds ahead of Temple. 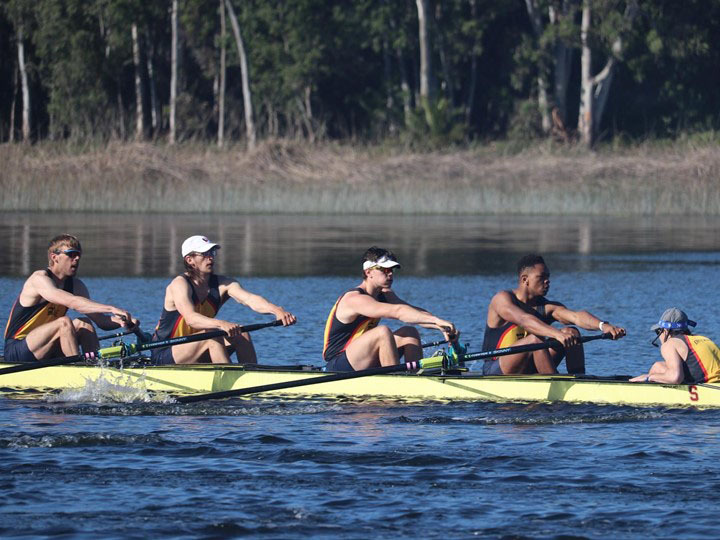 The women’s team traveled back to Cooper River the following day for the Cooper Sprints March 24. After some hard racing the previous day, the teams did not place well against some of the top ranked teams in the nation at this race. In the third heat of the women’s varsity eight event, the Dragons raced the United States Naval Academy, the University of Rhode Island, the University of Oklahoma and Villanova. As of March 20, Navy was ranked No. 26 in the nation and Oklahoma was ranked No. 28. Drexel came in fourth place, which put them in the petite final. The women’s second varsity eight and varsity four both got fifth place in the second heats. The second varsity eight moved on to the petite final, while the varsity four moved on to the third level final. The second varsity four won their heat, which moved them in to the grand final, the only boat to do so. The women’s varsity eight placed 10th overall in the event, while the second varsity eight placed eighth overall. The varsity four got 13th overall, and the second varsity four placed 6th overall. The men’s team traveled to Chula Vista, California at the United States Olympic Training Center to compete in the University of California San Diego Invitational March 30 and 31. The teams competing were Drexel, UCSD, Stanford University, Gonzaga University and the University of San Diego. At the beginning of the spring seasons Feb. 26, the Intercollegiate Rowing Association released the preseason rankings for the men’s varsity eights. Stanford was ranked No. 13 in the nation, and Drexel was No. 20, while USD also received votes. During the first racing session, the men’s varsity eight defeated UCSD by just over six seconds showing clear open water. The second varsity eight followed suit with a win over UCSD by almost three seconds. During the second session, the varsity eight had a clear advantage over Gonzaga coming in first with a time of 5:46.97, a season best so far. The second varsity eight defeated Gonzaga as well with a time of 5:55.65. For the final session March 31, Drexel raced a dual against Stanford. Stanford won the varsity eight race by 4.64 seconds ahead of Drexel, while the second varsity eight beat Stanford by 7 seconds. For their efforts, the women’s varsity eight earned the Colonial Athletic Association Boat of the Week. The women’s team will now travel to Mission Bay in San Diego to compete in the San Diego Crew Classic April 6 and 7. For more information, visit https://crewclassic.org/. For his leadership in the stroke seat of the men’s second varsity eight, senior Dario Vracevic earned the Drexel School of Education Athlete of the Week honor April 1. The men will have a couple weeks of practice before both teams will travel to the Potomac River in Washington D.C. to compete in the George Washington Invitational April 12 and 13.